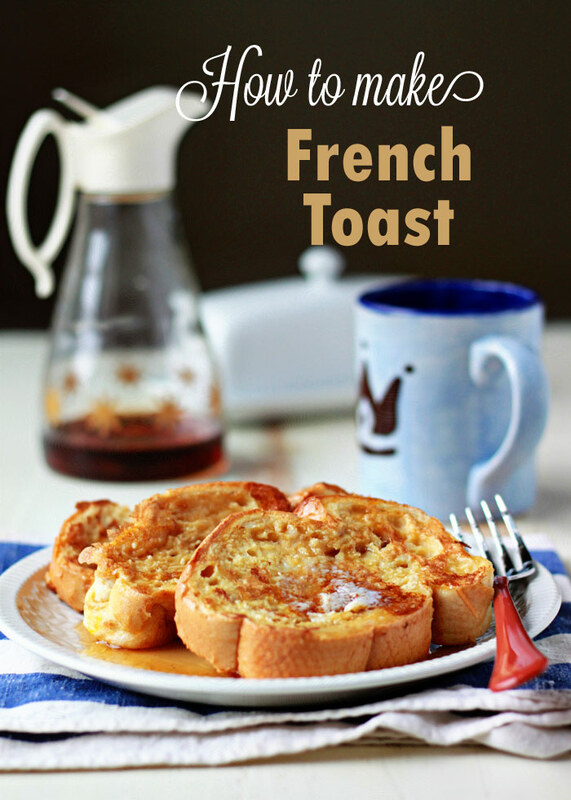 Just a few simple ingredients and steps and perfect French toast awaits! 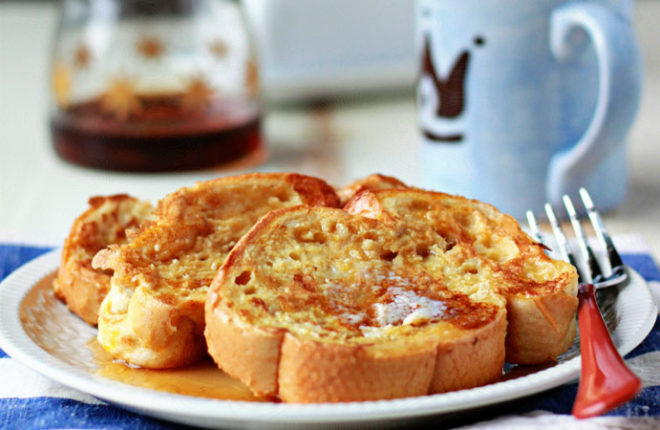 Step-by-step tips and instructions for making the perfect French toast every time. Before I delve in to the delicate intricacies of French toast making (ha, ha), first, I will share my three top tips for making sure it’s excellent every time. Yes, it may be a simple thing to make, but there really are a few methods to the madness! The dip – make it quick! 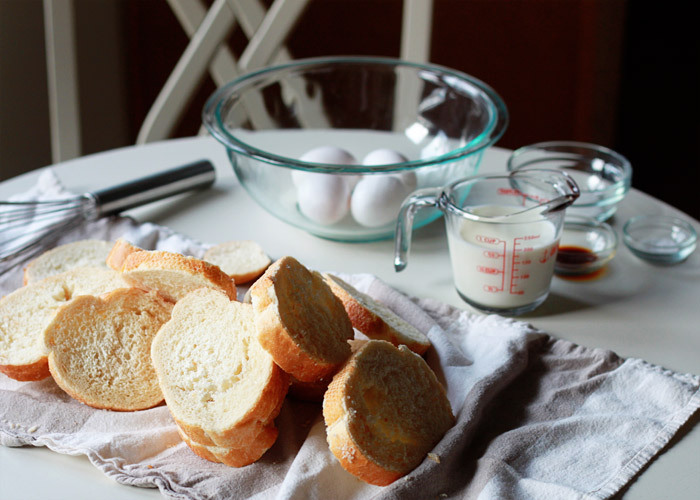 Rustic, hearty breads tend to hold up better to the egg batter – that soft white sandwich bread on the grocery store shelf is generally not the best contender for french toast. That said, no matter what kind of bread you choose, do try to make sure it’s stale! Day old – or two days old – is ideal. If your bread is still a bit on the fresh side, slice it up and let it sit out on the kitchen counter for an hour or two (or several) before whipping up your French toast. I used to think, oh, it’s easy to make French toast. Just whip some milk and eggs together and I’m good to go! Right? Wrong! The ratio of eggs to milk definitely makes a difference. Too much milk makes for a soggy result. The recipe I use calls for four eggs and 2/3 cup milk. That’s right – quite a few eggs relative to the milk! And it’s perfect. This is another misstep I used to make. I thought I really had to soak that bread in the batter. Five, six seconds or more. Not so! 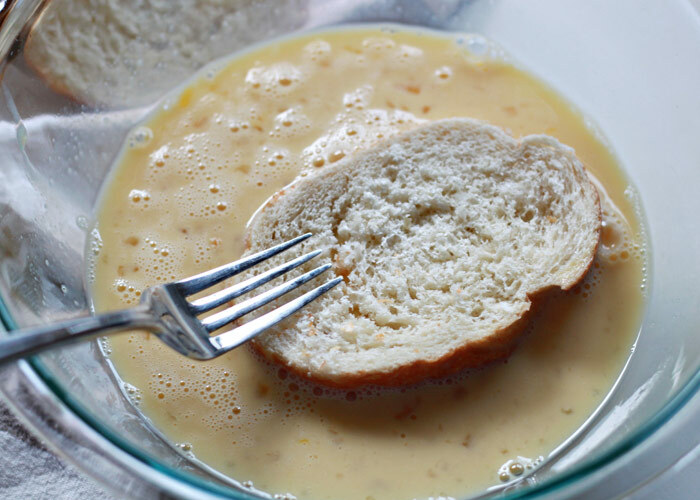 Just a quick dunk in the egg batter is all that bread needs for the perfect French toast. So now that you know the three tips for success, let’s do this thing! Here’s How to Make French Toast. Large eggs – the best you can find. Fresh milk – I use whole milk or 2%. If you’re going dairy-free, almond milk or soy milk can be a good sub. Bread – we covered that above. Hearty and stale. For this story, I used a typical loaf of grocery store French bread, but we often use a heartier whole-wheat version too. A tablespoon of sweetener (key, I think) – either granulated sugar or pure maple syrup works. Honey would do, too. Plus, a little flavor – vanilla, for sure, and nutmeg and/or cinnamon if you really want to amp it up. I like to give the eggs a good whisk before adding the rest of the ingredients – it helps them distribute well throughout the batter. Don’t you hate clumps of egg white on the edges of French toast? Me too! So whisk whisk whisk. I use a non-stick griddle to make French toast – it makes it easy to whip up large amounts quickly. You can also use a large frying pan on the stove top over medium heat. If the surface is non-stick, you probably don’t need any grease to keep the French toast from sticking. Otherwise, you may want to add a little butter before cooking each batch. Dip the French toast and place it on the hot (350 degrees or so) griddle or pan. Cook until golden brown, 1-2 minutes, then flip and cook the other side. 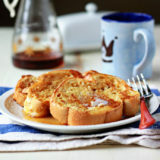 Transfer your French toast to a platter and cover with a kitchen towel to keep warm until you’re ready to serve. You can arrange the French toast on a platter or individual plates and sift a little powdered sugar over the top, or just serve as is. Pass with butter, drizzle with maple syrup, and you’re good to go. French toast is also awesome with lots of fresh fruit, or different flavored syrups – the possibilities are endless. Slice your bread and, if it’s not already stale, let it sit out for awhile to harden up a bit. In a large bowl, beat the eggs well. Add the milk, syrup or sugar, vanilla, salt, and nutmeg and/or cinnamon if using. Mix well. Heat a large non-stick griddle to 350 degrees Fahrenheit or set a medium non-stick pan over medium heat. If necessary, add melt a little butter on the griddle or in the pan to help prevent sticking. 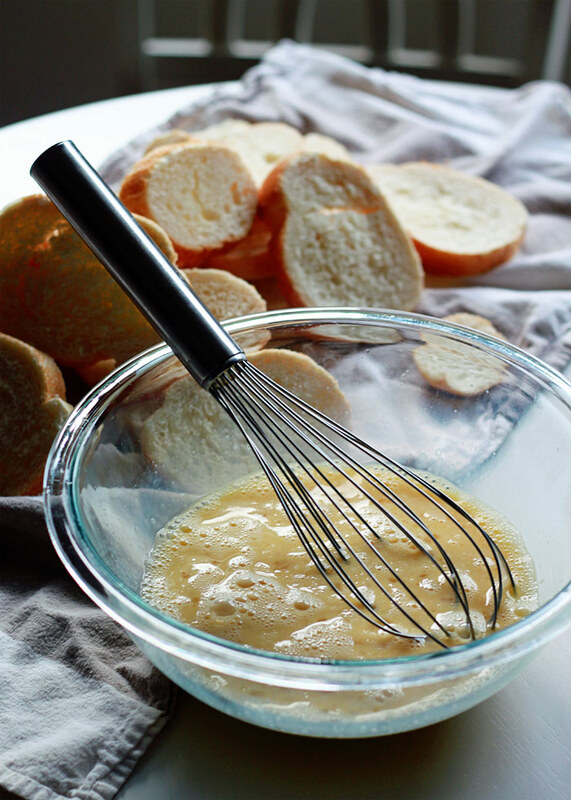 One by one, dip the bread into the egg mixture, using a fork to help dunk and maneuver. Dip for about 1 second on each side then transfer immediately to the cooking surface. Cook on the first side until golden brown, 1-2 minutes. Flip and cook on the other side until golden brown and the egg is cooked through, another 1-2 minutes. Transfer to a platter and cover with a dishtowel to keep warm until serving. Serve with whichever toppings suit you! Great tutorial! I can never make French Toast as good as my mom’s – I hope this will help me 🙂 Yum! My favourite French toast memory is having brunch with my best friend on her verandah and she had made brioche French toast which we then spread with leftover creme brulee and jam. Oh so decadent. Oh so worth it. 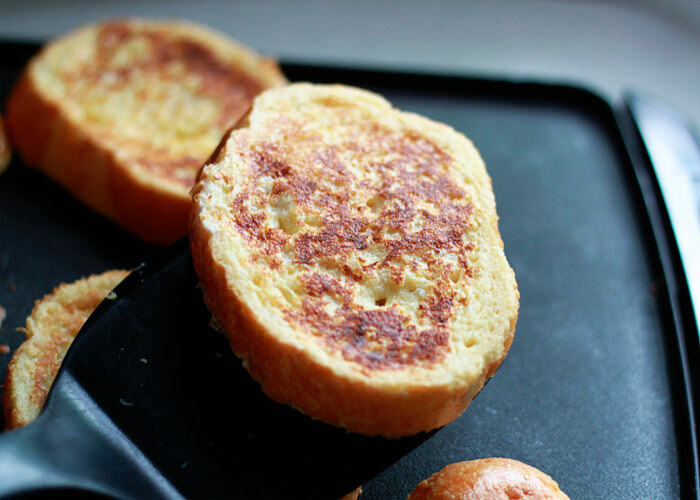 I can’t wait to find some decent gluten free bread (or make it myself 😉 ) so that I can once again experience the wonder of French toast – using your brilliant recipe! Thanks for sharing. Strange enough, I’ve actually never made french toast. Not sure why but it somehow never crossed my mind to do so. I’ll make it my assignment this weekend using your tutorial. Loved this recipe! I’ve always made French toast just egg n cinnamon but adding all the addition ingredients made it taste like I went out & had them made at ihop! They we’re great, and my 5 little siblings agree , thankyou!